Alan Shatter arriving this afternoon. FORMER JUSTICE MINISTER Alan Shatter has told the Disclosures Tribunal that former garda commissioner Martin Callinan told him in 2013 of the sexual abuse allegation against Maurice McCabe. Shatter said that Callinan “didn’t make a big deal about it” but let him know about it around the time that McCabe was making allegations of misconduct and malpractice within the penalty points system. The Tribunal is currently looking into allegations of a smear campaign against Maurice McCabe, with claims that it was directed by Callinan – with former press officer David Taylor as a go-between who gave journalists negative briefings about the whistleblower. This afternoon, Shatter told the Tribunal that dealing with issues surrounding McCabe was like “sinking in quicksand”. Shatter said that when he was contacted by McCabe over the issues to do with the penalty points system, he became determined to fix the problems. He said that McCabe had wanted to retain anonymity when he made these complaints, and that he respected him doing so. However, the former Fine Gael TD said that while many points McCabe had made were valid, “a number of very serious allegations regarding garda corruption… turned out to be unsubstantiated and incorrect”. Shatter said that he had a departmental official write to McCabe in late 2012/early 2013 suggesting that McCabe engage with an internal garda review into the penalty points matter, but McCabe opted to retain his anonymity. He said that – if he was Assistant Commissioner O’Mahony, who was in charge of the investigation – he would have tried to engage with McCabe at an earlier stage, or sought permission from the commissioner to do so. The former minister alleged that McCabe subsequently claimed this his allegations were not fully listened to. He said: “In circumstances where he could have engaged, in circumstances having claimed anonymity, he was now complaining he hadn’t been interviewed. I fully respected Sergeant McCabe had very valid reasons – initially – for wanting anonymity, but we went past that point. Shatter said that, despite taking action on the penalty points scandal, he was “publicly pilloried” over the issue, while then-commissioner Callinan was “demonised” for it. He also said that Callinan told him in 2013 about the 2006 Ms D allegation of sexual abuse against Maurice McCabe. Shatter said that Callinan told him “it had been fully investigated and the DPP directed there be no prosecution”. He said that Callinan “didn’t make a big deal about it” and they never discussed it again. Furthermore, he said that he never talked to anyone else – in his department or in Leinster House – about it. He also testified that he had no knowledge of the meeting between Callinan and John McGuinness TD in the car park of Bewley’s Hotel but, if he had, he’d have counselled against it. Previously, the Tribunal has heard that then-secretary general of the Department of Justice Brian Purcell was aware of the meeting, both before and after. Earlier, and after three and a half days in the witness box at the Disclosures Tribunal, Superintendent David Taylor closed his evidence by denying he had told Maurice McCabe “a load of lies” about the alleged smear campaign. The former head of the garda press office maintained that he was directed by Callinan to smear McCabe and also that he heard Callinan call the whistleblower a “kiddie fiddler” back in January 2014. 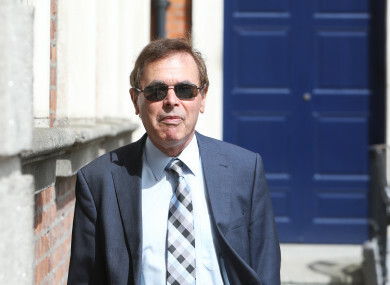 Prior to the closing of his evidence, Taylor faced severe scrutiny from counsel for former commissioners Martin Callinan and Nóirín O’Sullivan, who went on the attack over his account of the smear campaign. In statements to the Tribunal, various people such as Fianna Fáil TD John McGuinness, journalist Mick Clifford, independent TDs Mick Wallace and Clare Daly, and Sergeant McCabe have said that Taylor intimated to them that he conducted the smear campaign via text. It is also their case, in a number of instances, that Taylor gave them the impression that he was under criminal investigation because “he knew too much” about the smear campaign and that Nóirín O’Sullivan had ordered his phone confiscated so that any evidence of such a campaign could be deleted. Taylor denied that he said anything like this. His account of briefing journalists is also either not corroborated, or journalistic privilege has been claimed, by those whom he says he briefed negatively about McCabe. Counsel for Callinan and O’Sullivan closed with a sustained attack on Taylor’s evidence, ultimately accusing him of spinning a “load of lies” to McCabe over the smear campaign. David Taylor was asked today about paying a visit to the now-retired Martin Callinan after his arrest in 2015. It is Callinan’s case that Taylor was “agitated” and was “giving out” about his arrest. It is also claimed that Taylor said he was going to “bring down” then-Commissioner Nóirín O’Sullivan. It was alleged that Taylor said he blamed her for the criminal investigation that was launched against him for allegedly leaking information. A theme of the past two days has been counsel for the former garda commissioners putting it to Dave Taylor that he was aiming to “bring down” Nóirín O’Sullivan. It’s been alleged that Taylor said there was a criminal investigation against him because “he knew too much” about the smear campaign. Taylor has told the Tribunal that’s not true, but has said that he was “concerned” about getting a “fair hearing” because Nóirín O’Sullivan’s husband was one of the gardaí investigating him. Taylor responded: “I was removed from a job I felt I was doing a good job at.” This refers to his removal as head of the garda press office in June 2014. Instead of being promoted however, Taylor was moved to the traffic corps. “It was the manner in which it was done. I respect the right of the commissioner to move anybody,” he added. Similarly, Mr Justice Charleton referenced the Clerkin report – a report into claims that Taylor had leaked information to the press, although unrelated to the McCabe affair. Taylor said that he “accepted” the Clerkin report, and admitted that he had “let down his standards” over the matter. An assertion made by “respected journalist” Mick Clifford was put to him. Clifford spoke to Taylor around the summer of 2016. It’s his assertion that Taylor told him that the whole reason there’s an investigation into him was because Nóirín O’Sullivan wanted to get a hold of Taylor’s phone. This is vital because that phone would have evidence of her knowledge of any potential smear campaign. Again, Taylor said this wasn’t the case. We’ll now hear from Martin Callinan for a number of days, beginning tomorrow. Callinan completely rejects the claims made by Taylor regarding the smear campaign. He also rejects ever calling Maurice McCabe a “sexual abuser” or a “kiddie fiddler”. It is expected his testimony will contradict evidence already given by a number of parties, including Taylor, Fianna Fáil TD John McGuinness and Comptroller and Auditor General Seamus McCarthy. He’ll give evidence well into next week, and then we’re due to have Nóirín O’Sullivan up in the last week of May. Email “Shatter tells Tribunal that dealing with McCabe's claims was like 'sinking in quicksand'”. Feedback on “Shatter tells Tribunal that dealing with McCabe's claims was like 'sinking in quicksand'”.